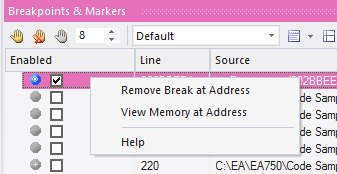 Data breakpoints can be set on a pre-determined memory variable to cause the debugger to halt execution at the line of code that has just caused the value of the variable to change. This can be useful when trying to track down the point at which a variable is modified during program execution, especially if it is not clear how program execution is affecting a particular object state. Set a normal breakpoint in the code so you can choose a variable. Then run the debugger (F6). When the program has hit the breakpoint, select the variable of interest and from its context menu, select the 'Break When Variable is Modified' option. There are no breakpoint indicators in the code, but data breakpoints are easily recognizable in the Breakpoints & Events window, being a blue icon with a white diamond. Enterprise Architect displays the name of the variable and its address instead of a line number. With the data breakpoint set, you can disable any other breakpoints you might have. 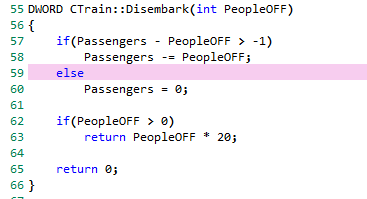 The program will stop at any line of code that changes this variable's value. Now run your program. When this variable is modified, the debugger halts and displays the current line of code in the editor. This is not the line that caused the break, but the line of code following the event. The event is logged to the Debugger window. Now we know how and where this value (its State) has changed. For example, the statement at line 58 has just updated the number of Passengers. Having discovered this and other places where this value is being changed, be sure to get rid of the notification before moving on. 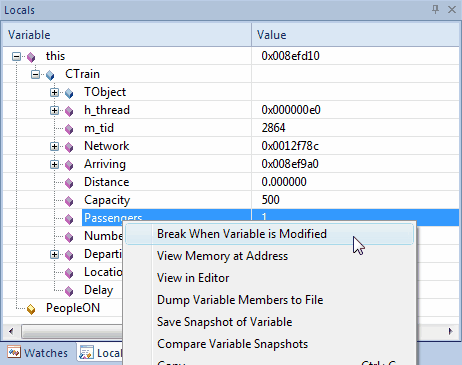 You can delete the data breakpoint quickly by selecting it in the Breakpoints window and pressing the Delete key. You can also use the right-click context menu to do this.